We have already talked a little about the sun spread, which forms the basis from which to do all readings. Since it is always from the Natural Order book with which we start our quadrations, it sets the stage for the first quadratic grand spread, the quadration for year zero covering the year from birth up to your first birthday. Once the first quadration has occurred, every year of the individual's life is represented by the next quadration of the book of cards. Basically it means that every year on your birthday you have a new configuration of cards in your life, which is represented by the quadration for that year. 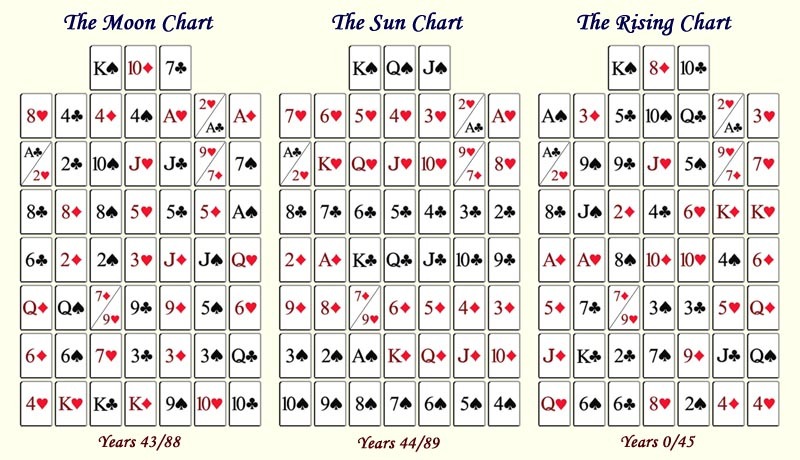 While continuing to quadrate the deck, and after 89 successions, you will arrive again at the sun spread (which is why the 'Years 44/89' label is shown below the sun spread. That means that on your 90th birthday, the grand spread for that year will be the same as it was the day you were born. And so the cycle starts again. As you can see, the year 89 spread (shown above as the sun spread) always precedes your moment of birth (or your first breath on this planet). That means that while you are in the womb, the effects of this spread are active. Now you see the importance of this sun spread. It represents the framework within which the individual worked during the gestation period of life, the year including conception and the 9 months up to birth. Now at first glance, the value of this sun spread may not seem apparent, or for that matter, how to consider it during a reading. You will see later that not only is it important, it is a key factor in interpreting a life reading for an individual. For now, just think of it as 'the representation of how what is came to be'. It represents the pure potential of any card based on its placement within the framework. The spread on the right in the diagram above is termed the rising spread. Due to the rotation of the karmic wheel in the clockwise direction, the rising spread exposes the social and environmental factors that shape the moment. At the moment of birth, this spread represents the active, rising energy to consider when preparing an Oracle Cards life reading for an individual. Furthermore, in a way similar to the workings of an astrological natal chart, the rising spread for year 0 represents a picture of planetary, sign and chakra alignments that will affect the individual throughout life. The rising spread represents the effort that will be indicated regarding the outer, tangible life activity requiring individual effort. The spread on the left in the diagram above is termed the moon spread. Due to the rotation of the karmic wheel in the counter-clockwise direction, the moon spread exposes the underlying karmic patterns that operate as the passive force 'causing' the moment. At the moment of birth, this spread represents the passive, reflective energy to consider when preparing an Oracle Cards life reading for an individual. Furthermore, in a way similar to the workings of an astrological natal chart, the moon spread for year zero represents a picture of planetary, sign and chakra alignments that will affect the individual throughout life. The moon spread represents the movement of our Soul through the realm of Spirit, and symbolizes a reflection of our desire to enter life, making the framework what it is. For those who can conceive of a past life, it would be the work that was undertaken during that life, and would contain all of its benefits or drawbacks based on the extent to which effort was applied. In the section on the Karmic Wheel, it was noted that the wheel spins in both directions simultaneously. This is an important concept that can only be understood from the abstract mental perspective. The quadrations start from the sun spread and the wheel rotates clock-wise to generate the rising spread. As the wheel rotates counter-clockwise it generates the moon spread. The rising spread and moon spread taken together represent duality in the realm of physicality. The moon spread represents the ground from which the rising spread emerges. The karmic wheel remains unbroken as the quadrations occur throughout life, but it is active even before the individual is born. It is through the effort of the Soul that the birth contract for life becomes realized. Ultimately, the Soul is already in a place of divine presence where no effort is required to maintain that position. But due to the Soul's desire to be closer to Creator, it makes agreements with the maker to be given the chance (Choice) to prove itself worthy of a better position. Using the compilation of the Soul's previous efforts (represented by the moon spread), a new life contract is granted (conception generates the sun spread) and the Soul is born into physicality (the rising spread becomes manifest). As each year of life unfolds, the movement of the wheel generates both the rising spread and moon spread symmetrically in order to maintain harmonic balance. Thus, the rising spread always represents our outward awareness of the moment, while the moon spread represents the forces that drew the moment into play. The moon spread is the oldest part of our history and represents the ground within which we cultivated this life. It also represents our roots, and the place from which we draw our vital nature. The sun spread represents our seed, or our pure potential. It represents the blessing which granted us this life. Within it is the source of our energy. With this grace, we attract the vital nature necessary to maximize the moment. The rising spread represents the part of our nature which responds to the moment. It represents the active part of our nature, and as such, describes the way in which others perceive us. It provides the arena for the characters and events to arise as a function of our karma. When doing a reading, these 3 spreads are taken as a whole and together represent an oracle chart. Each year a new oracle chart will be derived based on the quadration for that year. An interesting characteristic of this oracle chart can be seen when it is compared to the 3 segments of time. In the Oracle, the rising spread is on the right and the moon spread is on the left. The rising spread represents the Future, being the location where current events will show up requiring choice. The moon spread represents the ground from which the current incarnation sprouted. And the sun spread represents the pure potential (the seed) available to the Soul, where the choice is issued out in reflection of the Rising and Moon influences. The image on the right is a graphic representation of the makeup of the oracle chart. In the graphic, the seed represents the sun spread where the pure potential of the individual is present. At birth, the first signs of growth appear in the outer world as the sprout that emerges from the soil. 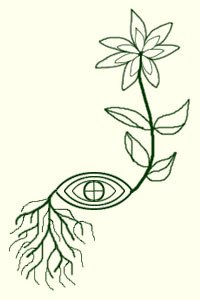 This is signified by the flower, and is shown growing on the right side of the seed as it represents the rising spread. The roots represent the moon spread for the Soul incarnation, and as is indicative of actual seed growth in this 3D realm, the roots are first to emerge from the seed as they draw in the nutrients necessary for the seed to sprout. In a relative way, the example shown here of the seed evolving through time can be compared to the evolution of our Soul incarnation as it is conceived, gestates and evolves throughout Life. The reflection of this example can be mirrored in such a way as to synthesize these 3 spreads into one single chart, and when compared to an individual spread, the imagery appears reversed. Thus, in an individual spread the divisions of time are separated such that the Past (reflection of the Moon) shows up on the right side of the spread, and the Future (reflection of the Rising) shows up on the left. Hopefully this helps to create a graphic image of how the microcosm and the macrocosm interpenetrate to form our 3D realm.